Persons under the sign of Capricorn quite often can show off with success in love sphere. These persons are very persevered and persistent, consistently aspiring to their goals. Seeking the second half in their case is usually successfully. Capricorns are also very social, opened and funny persons – that’s why quickly gain sympathy of people from surroundings. They are able to light the flame in the heart of even seemingly inaccessible person. Mainly want to build up strong, stable and long-lasting relationships, based on reciprocated love. They are characterized by a high honesty, without beating they say openly to their partners what they feel. They don't tolerate fraud, lie and hypocrisy from their partners. 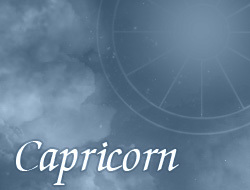 Capricorns most often belong to truthful, sincere and opened persons. Some are able to show them a great trust. They love romantic moments and gifts, which are an expression of partner emotions. They also treat very well their family; therefore with all their might try to provide an adequate prosperity for them. They often care to have many children.